So today is my birthday and I am taking it easy - no work, no big events, just relaxing at home. I think I might whip up some creme brulee for tonight. We shall see how it goes. 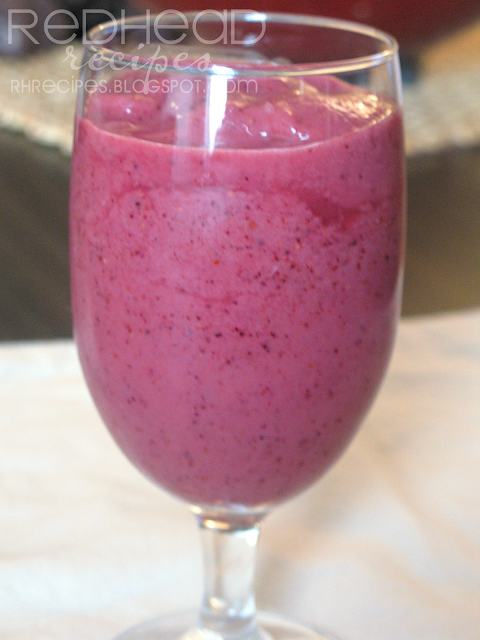 For my birthday I decided to share with you one of my favorite breakfasts - smoothies! (I also have these for lunch, dinner, or a snack!) It is freezing here, so this helps me remember the warm days of summer. This is more of a method than a recipe so pay attention to the tips at the bottom. Place ice, fruit, ice, lime juice, and enough fruit juice to come almost to top of fruit in the blender. 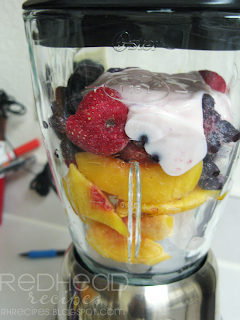 Blend until smooth, Add remaining fruit juice if needed to thin out the smoothie. Makes about 6 cups. The smoothie I have pictured has peaches, strawberries, blueberries, strawberry yogurt, and grape juice. Put the food in the blender in the order I listed. It makes blending easier because the ice doesn't just float and avoid the blades. I like my smoothies a little thicker - add more juice or even milk if you want to. I like my smoothies to have something tart - so that's why I add lime juice - use your judgment. Taste before serving it up - depending on the ripeness of your fruit you may need to add sugar or something a little tart to cut the sweet. Happy Birthday Sarah! Hope your relaxing day is relaxing. 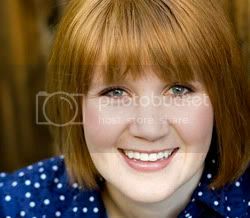 Happy birthday, Sarah! Thanks for the smoothie reminder. I always forget to make these and they're so yummy! Happy Birthday Sarah! And thanks for the tip about adding something tart. I always forget to do that! I've been wanting to try some smoothies! This sounds yummy!!! Happy Birthday, Sarah. The smoothie looks fantabulous.